Move It Media is excited to partner with the Michigan Department of Community Health to strengthen Michigan Diabetes Prevention Network’s relationship with providers of the YMCA Diabetes Prevention Program and EnhanceFitness. The Michigan Diabetes Prevention Network fall meeting today laid out exciting partnership opportunities between the YMCAs, MDCH, NACDD, CDC, AMA, Kidney Foundation of Michigan, MSU Extension, University of Michigan, and many other community based organizations and healthcare providers to expand the Diabetes Prevention efforts across Michigan. Dr. Christopher Bailey of the American Medical Association shared with us the AMA’s strategic plan to address cardiovascular disease and diabetes, which together cost our nation more than $5 Billion annually along with the devastating health toll they take on individuals and families. 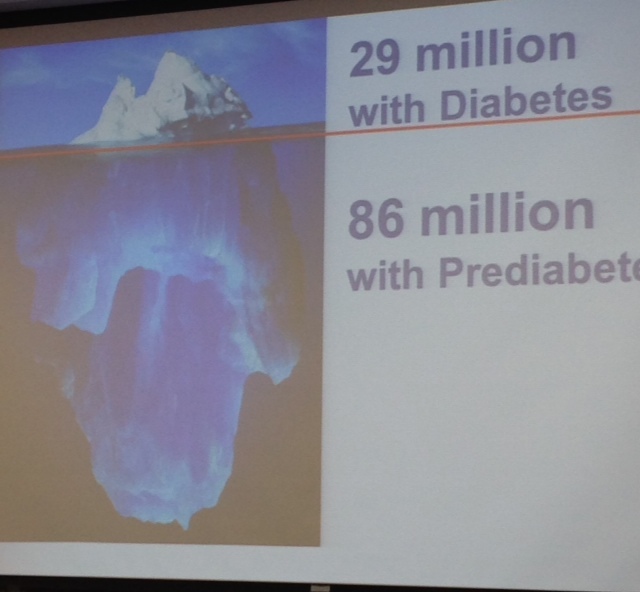 We must get very serious and strategic about scaling the proven Diabetes Prevention Program because the scope of the problem facing us as a nation is gigantic as illustrated in this dramatic slide. We simply can’t afford this impending public health disaster and must work collaboratively with all partners to address this population health problem. I look forward to working together as a state to scale the proven programs which can delay or reverse the onset of Diabetes. I’d love to talk to you about efforts in your community to provide evidence based programs to prevent or manage chronic disease.